I installed the webroot secureweb app on my iPad. Here is a list of issues. Any help is greatly appreciated. 1. After installing, my account still indicates I have NO mobile devices protected in contrast to the webroot website instructions. 2. There is no toolbar at the bottom of the secureweb window. 3. Because of (2) it is hard to find bookmarks. 4. Once I found the bookmarks there was no option to edit the name of bookmarks. 5. The reviews on the Apple app site are ALL negative with only one exception and I don't think that user understands how to use the secureweb app. 6. I thought Webroot provided 24/7 support. Guess I was wrong. Has anyone found solutions to issues 1-4 above? Thanks for your response;however, I am the only user so there is no user to add. When I click on add device it just wants me to download the secureweb app again. It says once I install that app that the device (iPad) will be automatically added to my protected devices. There is still no way to edit naes of bookmarks. I can see why this app gets such poor reviews. I have SecureWeb on my iPad and I am not having any issues. Open the SecureAnywhere website menu and click Manage Users. Locate the user whose permissions you want to change and click the edit icon. [img]http://sw.nohold.net/Webroot/Images/wsa_manageusersnodelete.png[/img] The Account Settings page opens to the User Details tab. 4. Set Permissions to Access. Webroot does have 24-7 Support. You just need to Submit a Support Ticket and they will get back to you usually in 24-48 hours. Support can help you with any issues you are having. You can also call Support during Business hours M-F but they will be closed Monday for the Holidays. Thanks much. What about changing the name of a bookmark? I don't believe you can change the name of a Bookmark. I am not aware of changing a Bookmark since I have never done that to be honest. But I am not seeing on SecureWeb that this can be done.You can Add, Open or, Delete Bookmarks. This might be a Idea that you can bring up in the Feature Request and others can Kudo this and then the Developers might add this to SecureWeb. After installing the Webroot app on your iOS device, it does not appear in the online management account under Mobile Security as Android devices do (below). This is as designed. Because of how Apple controls the apps that are available for their mobile devices, there is currently no way to get a virus on them. In turn, there are no antivirus apps made for Apple mobile devices. 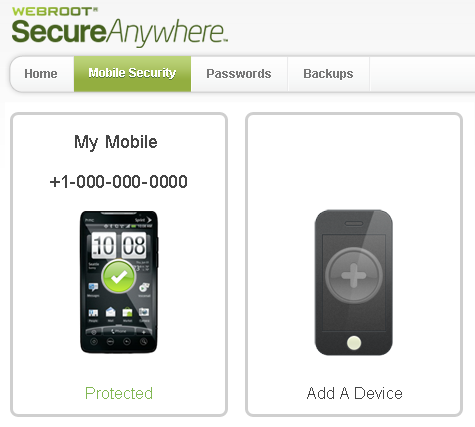 (Webroot does provide a SecureWeb application for iOS devices to protect your information online). Since there is no antivirus available for these devices, they will not be listed in the Mobile Security section of the online management account. If you are using the Backup & Sync app, only included in SecureAnywhere Complete subscriptions, then you will see the device listed in the Backups section of the online management account. I am sorry to hear that there are bad reviews for this Program. I have found SecureWeb to be no trouble. Because it does protect me from malicious sites and protects my information online with my IOS.